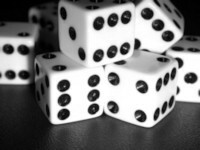 Double Cameroon is a dice game that can be thought of as "Yahtzee times two". Like Yahtzee, each turn consists of up to three rolls, holding back the dice you wish to keep on each throw. After your roll(s), divide your dice into two groups of five each, and mark your score in two open categories. There are no "Three of a Kind" or "Four of a Kind" categories, no "Chance" category, and no bonus scoring. The winner is the player with the highest point total after five rounds!